These all purpose brushes are used to clean hundreds of areas in the workplace. Ceilings, walls, furniture, floors are all cleanable with our brushes. Carlisle Hand And Nail Handle Brush 5 in. Tampico Fill Yellow Handle Countertop Black Brush - 12.5 in. Iron Shaped Handle Cobalt Scrub Brush - 6 in. 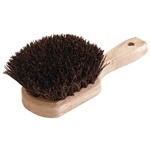 Synthetic Fill Green Wash Brush - 10 in. Flagged Polypropylene Fill Countertop Silver Brush - 12.5 in. Plastic Handle Yellow Utility Brush - 8 in. Long Plastic Handle Yellow Utility Brush - 20 in.